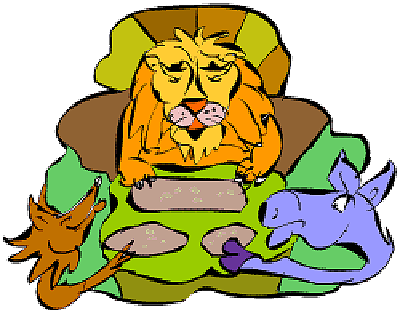 Once, the lion went into the jungle to hunt a game with the fox, jackal, and the wolf. While they were hunting for a wild game, they saw a wild stag feeding in the meadow. When the stag is not paying attention, the lion, fox, jackal and wolf all came upon the stag and attacked it. They killed the stag. Now the lion, fox, jackal and wolf have to divide the share of good between themselves. The lion is the strongest so it stand in front of the stag’s carcass and announces: The first quarter of the stag’s meat is mine because I am the King of the Jungle; the second quarter of the stag’s meat is mine because I am the wisest arbiter here; the third quarter is also mine because I am the fastest when chasing after the staf; but the fourth quarter of the stag’s meat will be given to anyone here who would dare to fight against me over it. The fox, jackal and wolf knew that they couldn’t beat against the lion and so they all went away with their tail between their legs. You can share your labors with the great bully, but you will never reap the spoil.